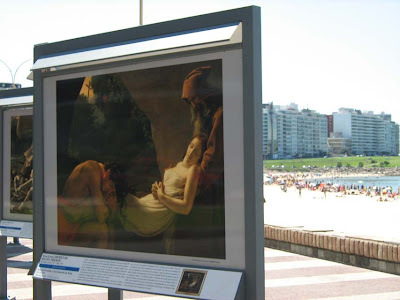 The Louvre Museum has arrived for a while to my country Uruguay literally at the beach and on the rocks! 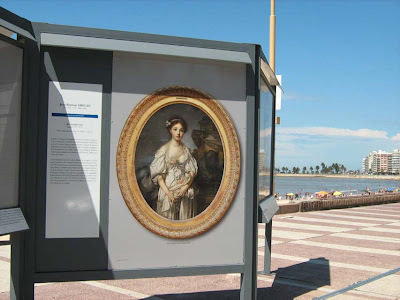 These are the Louvre paintings courtesy of the French embassy exposed at the Rambla de Pocitos beach in Montevideo (Capital of Uruguay). I took some of them but there’re several block with plenty of them. It’s a very nice walk. I’ve been awarded twice for 2 excellent blogs. This sweetness and happiness must be shared with others! Kimberly of Terrier Lover Blog and also she manages Cooking With Kimberly thanks so much Kimberly! The second Kreativ Blogger Award came from Natasha of Healthy and Gourmet also thanks a lot Natasha! In all cases go, visit and enjoy their fabulous food blogs. Take your time totally worth! Note: I would like to share some these awards with Shelby, Natasha and Rosa but I’m pretty sure that they already have them 🙂 Therefore it’ll be for other occasion! If you enjoyed your read, Subscribe to my RSS feed or get updates by Email! Thanks Gera:-) & Thanks for more than just the awards:-)u have done it again! Thanks for this award and for sharing aspects of your beautiful country. Forgive my ignorance but I did not know that there was such a strong french influence in Uruguay. Now, I know. Thanks again and keep sharing your knowledge and experience with us. Dear Gera, thank you so much for sharing the award with me, very kind of you. And Congrats to you for these well deserved awards. I didn’t know the French influence, either. This post really helps me to have an image of Uruguay. I’ll keep learning from you. Gera, Thank you so much! 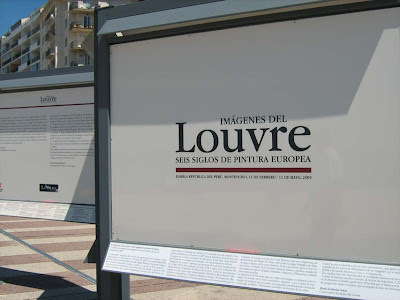 It is so wonderful to see the Louvre prints on public display like that. So few people get to see them in real life that it is wonderful to be able to just walk by them. That beach looks lovely! Are you headed into winter now? Does it ever really get cold? Congratulation on your award, and thank you so much for passing the award to me. I am so humbly honored. Thank you so much Gera! It’s a pity that I know very little about your country. You see, I didn’t even know that Uruguay is influence by the French. Where I have been all of this year? I shall start googling and learn more. The beach is gorgeous, and how they display all of those painting? They must have some protection, I suppose it’s a safe place too. Nobody try to steal them? I am just impress here. Those are some really great pictures! Congratulations on your awards and thank you SO MUCH for passing along the Kreativ Blogger Award! This is the first award anyone has ever passed on to Taste As You Go! I’m am so incredibly honored and touched! 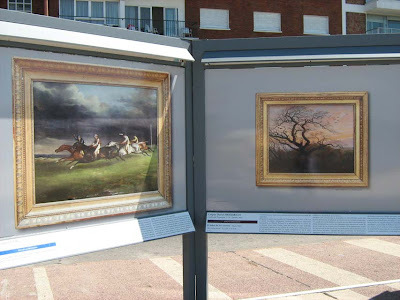 That is so cool that the Louvre paintings are displayed like that — outside in such a gorgeous, natural setting. It’s so intriguing to see them that way, and not hanging in a dim gallery as usual. Congrats on your awards, too. Well deserved! Congraulations, Gera! These awards are well-deserved for your efforts to highlight healthy and delicious food. Thank you for the mention and for sharing these beautiful photos. I can’t imagine how wonderful it would be to look at these masterpieces in such an amazing setting! 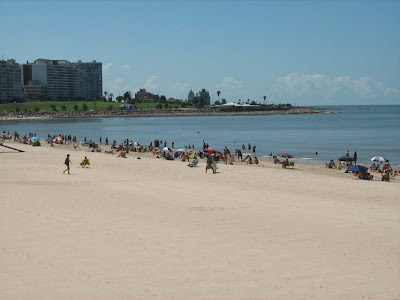 I can’t tell you how much my husband and I want to visit – we know so little about Uruguay and most of South America to the extent that we didn’t realize the very strong European flavor and atmosphere of your country as well as Argentina, Brazil and Chile (just to name the other destinations we dream of visiting). Please keep up the wonderful work on your blog! Thank you for thinking of me Gera! 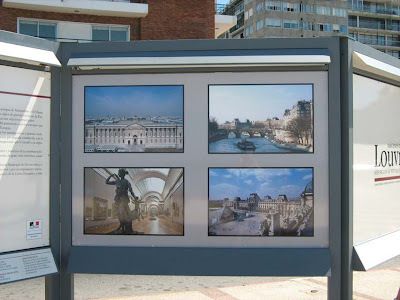 The photos of the Louvre are great to see and I love how they are displayed….not to mention that beach is beautiful. Sure wish I could be there instead of here in 20 degree weather! 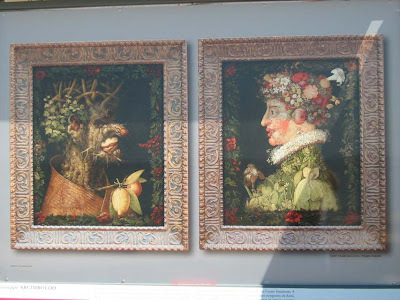 The paintings are obviously excellent reproductions-photos and there’re persons to watch over them all day and night. 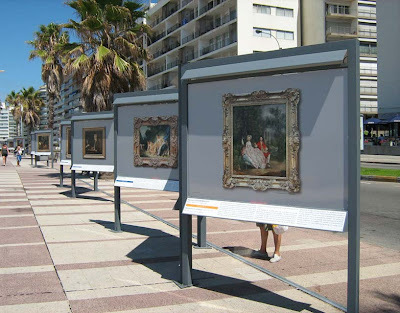 They’ve cultural value no commercial and looks great by night, each with the correspondent light! Certainly they’re beautiful pictures that worth to see them slowly one by one! Gera-Hurray for you–TWO AWARDS!And beautiful Artwork on the beach too. Cool. Those other food blogs you mentioned-Great Blogs also-enjoy them too. YEA. A great exhibition! Congrats on the awards! You’re always welcome and glad you like the artwork-pics. Thanks for stopping by! Thanks so much for this awesome award! I really appreciate your friendship and talent as a food writer, Gera! I will certainly pass this award on too! Wow Gera you are lucky! Great place to live eh?